Nigeria’s Home-based Senior Team will fly out of the country tonight for the 5th African Nations Championship taking place in Morocco, 13th January – 4th February 2018. 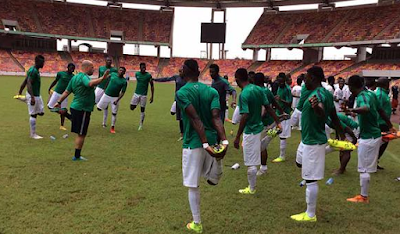 Team Administrator, Dayo Enebi Achor at the weekend said that the delegation will fly aboard a Turkish Airline flight from the Nnamdi Azikiwe International Airport, Abuja, and connect Rabat from Istanbul on Tuesday morning. “The team will train for a few days in Rabat before heading to Tangier on Friday, 12th January,” Achor said. The Ikechukwu Ezenwa –captained squad will take on Rwanda at the Stade Ibn Batouta on Monday, 15th January, starting from 7.30pm (8.30pm Nigeria time), before games against Libya at the same venue on Friday, 19th January (starting from 4.30pm; 5.30pm Nigeria time) and Equatorial Guinea in Agadir on Tuesday, 23rd January (starting 7pm Morocco time; 8pm Nigeria time).